How dumb is really dumb? A woman from South Carolina was looking to score a sweet deal on an iPad, but what she got instead was a block of wood with a photo of an iPad pasted to the top. Ms. Ashley Mcdowell, from Spartanburg, South Carolina was purchasing dinner from a local McDonald’s when she was approached by two men in the parking lot, who wanted to sell her either an iPad or a laptop. While showing her a brand new iPad, the men explained that they had purchased the iPads in bulk, and were now selling them for the discounted price of $300 from the trunk of their rimless Impala. McDowell explained that she only had $180 in cash with her, and the men generously agreed to accept the money. The men handed her a Fed Ex box, and rather than checking it out at the scene, McDowell drove home. 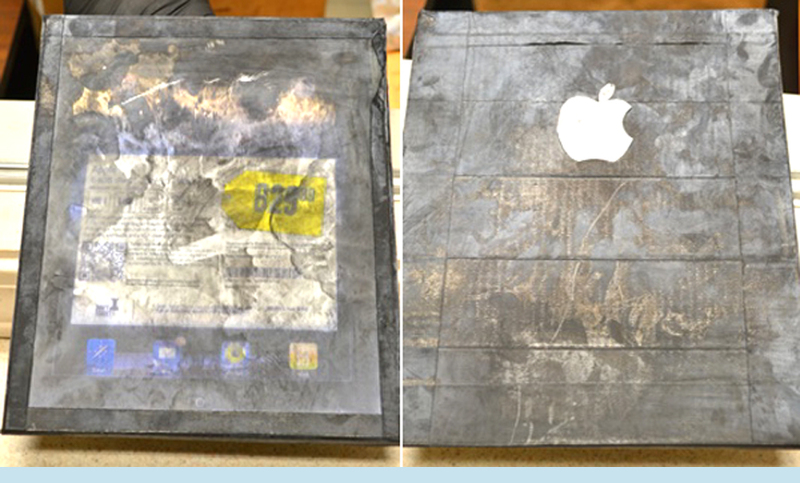 When she opened the box, she didn’t find an iPad – instead, she found a piece of wood that had been painted black and decorated with an Apple logo. Two clichés that come readily to mind are, you get what you pay for and if it sounds too good to be true, it probably is. Last week, the long losing streak was finally broken with all the major indexes moving higher. The Nasdaq vaulted 5.9%, the S&P 500 leaped 4.7%, the Dow added 4.3%, and the NYSE composite gained 4%. Tuesday’s jump, across all indexes, on higher volume, constituted a follow through day and changed the IBD outlook to “market in confirmed uptrend”. However, Thursday’s backslide, on volume higher than Wednesday, was a distribution day, indicating institutional selling, and pushed the IBD outlook over to “uptrend under pressure”. A distribution day coming this soon after a follow through day almost always dooms the new uptrend to failure. Nonetheless, Friday’s upward surge wrestled the IBD outlook back to “market in confirmed uptrend”. So, while it’s technically okay to start buying stocks again, proceed with caution and build positions slowly, in small steps. Wait to see if, against the odds, this new, fragile uptrend can grow some bull horns. This week, unfortunately, or maybe just as well, none of the watch list stocks are at or near proper buy points. They sustained too much technical damage during the correction and it’s going to take some time and positive market action to repair the charts.